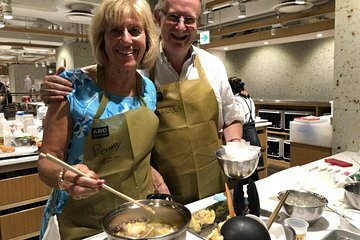 We took a tempura class at the ABC Cooking School, Marunouchi Studio, with Teacher Miwa. This is a cooking class that parents and kids, children and adults, all can enjoy. Ask for Miwa Sensei. She is warm, kind, thorough and detailed in her explanations. We definitely recommend this class, this school and especially this wonderful teacher! When we return to Japan, we will definitely take more classes!!! ABC Cooking Studio (Marunouchi Studio) was easy to get to and it was so clean!!!! !